Necessary procedures are in place for the policing of the movement of animals. Their purposesinclude the prevention of the spread of diseases and welfare of animals. Dogs and cats may have their own passports and this type of policing is important to stop rabies entering the UK. Registers provide details of births, locations, numbers and other information relevant to each and every animal! Every time an animal is moved, for example, from farm to market or slaughterhouse, or for export, its identification and movements are recorded by local, national andinternational officials. This ensures that all livestock is traceable at any given time. Policing helps to prevent the illegal movement of animals and cases of ‘mistaken identity’ thatmay otherwise occur through unscrupulous people! Certificated pedigrees, registers and individual identification procedures can protect the animals as much as buyers and sellers of livestock. There are different marks for herds of pigs and flocks of sheep, cattle and horses have passports. Even if only one goat or sheep is kept as a pet, identification and movement regulations must be followed. It only takes one diseased animal to start an epidemic if people are uninformed. How is Policing Carried Out? Travel documents, including animal transport certificates and journey logs are kept by thoseinvolved in the movement of livestock and must be provided upon request by officials. The land on which livestock is kept needs a County Parish Holding (CPH). These are issued by the Rural Payments Agency and must be obtained before animals are kept on the land. Trading Standards officers work to enforce laws put in place to prevent the spread of animal diseases on farms. Governmental veterinary services work together with them and DEFRA, to control outbreaks of diseases like Foot and Mouth and to ensure the welfare of animals in transit. There is a standstill period for animals that have been moved to new premises, even if they appear healthy and show no signs of illness. It is a preventative measure, so, until that timeis up, they are not allowed to be moved anywhere else to prevent the possible spread of disease. Efficient tracing of registered livestock can show which herd/flock has recently moved, is on the move, or is intended to be moved in the near future. Cattle movements in particular come under many regulations. The movement of herds must be reported to the British Cattle Movement Service in advance. 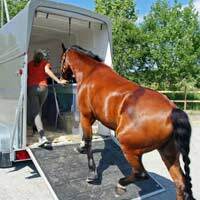 Owners are responsible for checking their animals prior to moving them. Local Animal HealthDivisional Offices have a Divisional Veterinary Manager who can be consulted if livestock show signsof any infectious/contagious disease and procedures put in place to prevent further spread. Animal movement licenses may be cancelled with immediate effect. Animal passports, licenses and approvals are among the necessities to be carried with livestockintended for export or import. Quarantine regulations are in place for certain types of imported animals and those pets whose paperwork is not accepted for import. Teams of animal health officials work together with governmental bodies to monitor the movement of animals through our ports and airports. They do spot-checks to make sure driversof animal transporters have the correct paperwork, the animals are not being harmed in any wayand that they are the right animals on the right vessel! With other animal based career workers, atports and airports, any suspected illegal movement of pets and exotic species is also policed and action taken against people who break the law. There are too many rules and regulations covering the policing of the movement of animals to list in one article, but the breakdown is that policing exists to protect animals and people. what legislations would be involved with the movement of exotic animals?